The climate occupied by initial invaders (black, dashed) resembled the home climate (black, solid). As the invasion progressed, Johnsongrass moved into cooler habitats in the US (grey, solid & dashed). Noteably, these are not climates Johnsongrass occupies in its native range in Eurasia, although they are available. 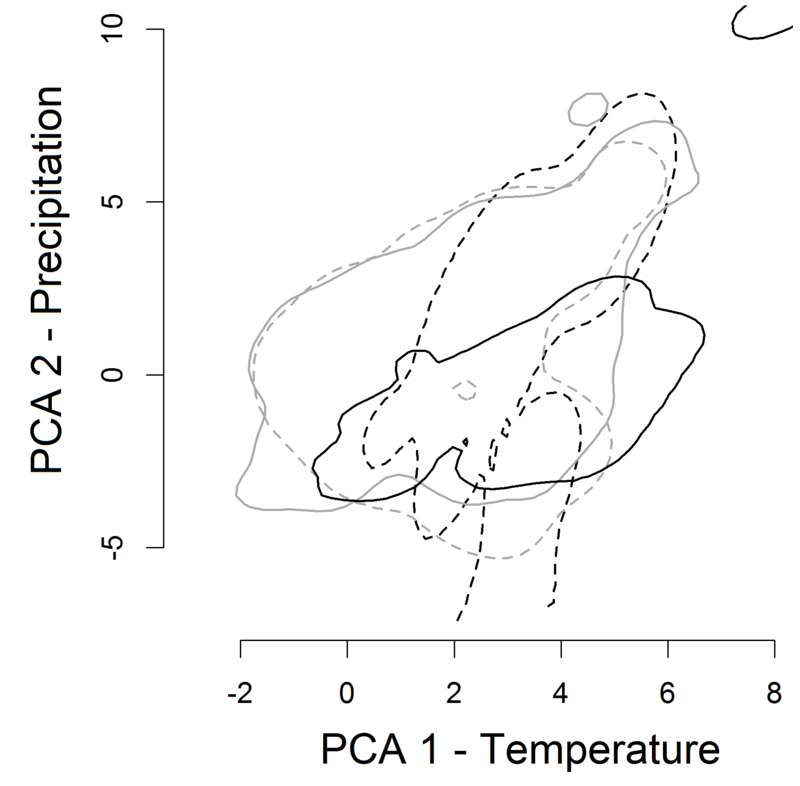 How invasive species change their climatic niches in their introduced ranges is a mystery. Invasive species must deal with enormous environmental variation in their introduced ranges. Some evolve rapidly, and others tolerate a wide variety of conditions. We examined how one invader, Johnsongrass, has responded to environmental variation in North America. This devastating agricultural weed is ever-present in the fields, roadsides and railways of the United States. Almost 500 individual Johnsongrass plants collected from 70 locations in the United States show enormous variation in their size and shape. Plants from cool, wet climates grow especially large, growing 10 feet tall and gaining almost 5 pounds of dry weight in a single year. Plants from agricultural habitats grew much larger and taller than those from roadside habitats and meadows, and responded differently to growing conditions. These results paint the clearest picture to date of how an introduced species changes genetically and phenotypically as it encounters habitat variation in their introduced range. Local adaptation and phenotypic plasticity play important roles in the ability of Johnsongrass to invade the United States.